Arrangements can be made for customers to view examples of completed projects. We cover all aspects of groundworks which also include slabbing, cobbles, York stone, patios and concreting. Excellent service, arrived on time and continued to work through inclement weather to get the job finished. When problems arise, Alan is always willing to offer solutions to the problems, finding a way to complete the job. Quality work with a quality finish. Yet again Alan provided us with an excellent service at a reasonable price when we had an urgent groundwork problem. I will always recommend Alan, his work is exemplary. Alan Bailey provided a highly professional service, and gave us solid technical advice where and when needed. Overall an excellent quality of workmanship. 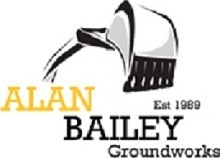 Highly recommend Alan Bailey Groundworks Ltd. Alan and team will provide a professional, efficient and cost effective solution to any groundwork requirement. Services include drainage and septic tank installation, paving and driveway, concrete bases, agricultural works, fencing, groundwork, retaining walls, JCB and mini digger works. Alan is your one stop shop for groundwork's, he will co-ordinate orders and deliveries so you can be rest assured that the project will be finished on time and to a very high standard. I have no hesitation in recommending Alan Bailey Groundworks Ltd. I asked Alan to do some work for me, giving me access to a field over a stream. He waited until the ground conditions were suitable, therefore leaving a very neat and tidy job. Highly recommended. I have used Alan Bailey on many occasions and always found him to be reliable and very thorough in what he does. Alan Bailey Groundworks Ltd offers a value for money quality service. The job was completed without hassle or worry, I felt confident and relaxed knowing that Alan and his excellent team had everything under control. I highly recommend Alan Bailey Groundworks Ltd for jobs large and small. Excellent work carried out completely satisfied, high standards with a friendly and cheerful approach to any job required. Trustworthy, pleasant father and son team. Reliable and a good timekeeper. No hesitation to trade with this company again or recommend. Really pleased with the work. It was carried out exactly as described and the front garden left very neat and tidy. Hard working men who made a first class job, all work carried out to a very high standard and completed within the price agreed. Pleasure to do business with. Our requirement was not extensive but we were made to feel valued and we could not have asked for more in both the logistics and the execution. Excellent and a professional job done. Highly recommended. Alan and his son Joe carried out the work in atrocious weather conditions, it rained 2 full days out of 3! Both worked extremely hard and left the area clean and tidy. The job was required to be done within a certain timescale and happy to say this was achieved with time to spare! Delighted with the end result! Highly recommended if you want a true professional to do groundworks. Prepared a large area for a new patio, prepared footings and concrete foundations for an extension to the kitchen. All work completed to a high standard and meeting all building regs. Seven skips of soil removed and a large amount of concrete delivered to the rear of the house with no mess or damage to the any part of the property. Built the damp proof course in blue bricks so also has impressive building skills. Both Alan and his son Joe worked extremly hard with a real commitment to their work, keeping the site clean and tidy through out the job. Very clean worker. Left site clean & tidy. Alan and son Joe are an absolute pleasure to work with. Both are very pleasant and very hard working guys. The quality of work is second to none and I look forward to working with them again soon. Alan always carries out this work with great care. Is thoughtful and keeps to his word. Reliable, honest and takes a pride in his work. The job is not finished until you are satisfied. Great team to work with. As with previous work all done to a high standard with attention to detail. Alan Bailey arrived on the day he said and the work was completed in just over a week. I have never seen workmen work so hard. I would definitely recommend them to anyone requiring groundwork, walling/slabbing. Very cheerful and pleasant operator, keen to do whatever was required. He used his expertise to translate my requests into 2 satisfactory outcomes. A job professionally done. Good value for money. A good company to work with, very accommodating. Excellent tradesmen, punctual, good value for money, excellent workers. Very satisfied. Punctual, hard working. Great service and outstanding job from a very nice team. Thank you!